Sh*tfit of the day is a bit like the commonly seen “Outfit of the Day”, except that it’s not about outfits and there’s much more sh*tfitting. Disclaimer: this is not intended to be a relaxing read. Does anybody have any luck with foot files? What is the point of foot files? Unless you have a whole day to spare, they never make the slightest bit of difference. Perhaps I have particularly horny feet – and by that, I obviously mean that they are ‘thickskinned’ rather than sexually charged. The thing is, though, I know that I don’t have thickskinned feet, I just have a couple of stubborn patches that never get any softer! So if my feet, which are in reasonably good nick, don’t respond to a filing, then what about people with feet like hooves? And there are plenty of them, you see them on the tube in the summer, shamelessly flip-flopped. My Mum has the most success with foot files out of anybody I know. She once rang me to say that she had foot-filed so much that smoke had started to appear around her heels – she must have been sawing back and forth like an absolute maniac! Perhaps I don’t have the patience for it, or perhaps – perhaps – somebody needs to invent a footfile that actually works. That doesn’t require 85,000kCal of energy just for the left foot. That spits foot-dust into the air so fast you’ll need to use breathing apparatus when you use it. I have an idea. 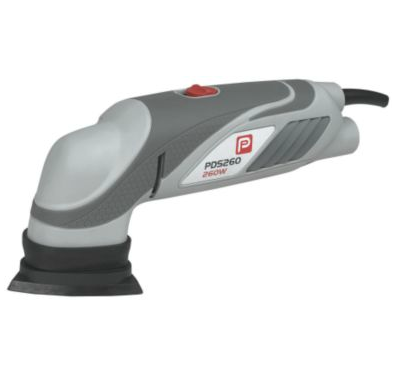 Behold the Performance Power Detail Sander PDS260. If this can strip a door down in ten minutes, just think what it could do for your feet! Five seconds with this baby on full power and you’d probably lose a shoe size! And possibly maim yourself for life, but that’s obviously by-the-by. I jest, of course – please don’t go and file your feet with the sander in the garage – but part of me is thinking; there must be a beauty equivalent of this. And don’t say “ped egg”, please. Satan’s parmesan grater. It’s awful. A top podiatrist once told me that the only way to file feet properly is little and often and never with a metal file. 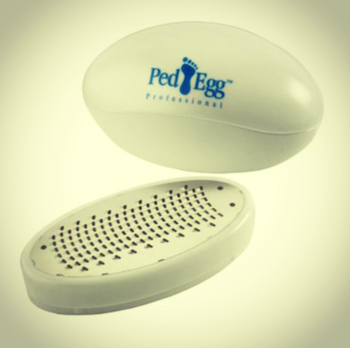 The ‘cheese-grater’ files don’t take off skin smoothly and you’re left with raggedy, uneven surfaces that are actually worse for your feet than just leaving the hard skin. The podiatrist said that once a day with a sandpapery footfile was the way forward. BUT I WANT TO FILE IT ALL OFF AT ONCE! I DO NOT HAVE TIME TO SIT THERE SKIMMING OFF INCONSEQUENTIAL LAYERS! So please can somebody invent a foot-sander? Perhaps it could come as an attachment for the Clarisonic? I’m accepting prototypes as of today, I’ll test them on Mr AMR.